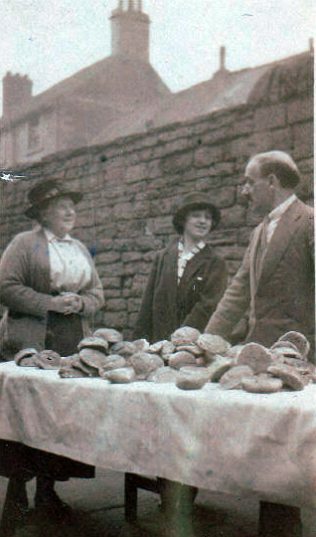 This photo is of the distribution of the hot cross buns in Mansfield some time in the late 1920s, possibly at the Old Meeting House. The people are (from left to right) Mrs Ward, Mrs Pedley and Dr Randle. The lady in the centre of this photo, Mrs Pedley, is my grandmother she lived at 5 Newcastle St, if you look at the other photos of hot cross buns, she can be seen in the 1965 and 1967 (stood next to the Mayor) she distributed the buns every year until her death in the early 70’s. As a young member of the Old Meeting House I recall very clearly the Hot Cross Bun Rush. I started to attend OMH about 1960. Trestle tables were placed in a long line down the big school room and kids would start queuing down the terraced street that led to the big gates to the Old Meeting House. When the gates opened it really was a rush. If they ran round the block quickly enough they got a second bun , if there were any left! The buns were paid for with monies left to the church by a late member of the congregation( I think her surname was Mallatratt but I may be wrong) who left provision in her will for a certain amount of money to be spent each year on the buns. Obviously as time went on the money bought less and less buns and peoples need of a free bun waned. I can remember the smell of those buns now. There were hundreds piled up on the tables. Great memories. I, too, remember the Old Meeting House. I was a member of the Chads Club in the early 1950s and I remember meetings being held there. If I remember correctly, it was set back, up some steps, from Stockwell Gate. My grandparents were the caretakers at the Old Meeting House between 1946 and 1951. It appears they were the first to “live-in”, as part of their wages included living rent free at the Old Meeting House Parsonage (in front of the Old Meeting House). Granddad (who was the actual caretaker) was paid 25 shillings a week and had free coal, gas and electricity. When a badminton club later applied to use the facilities it was decided that “the caretaker, for washing up, be given 3d [old money] for a dozen articles.” The previous caretakers had been Mr. and Mrs. Pegg and when my granddad became ill they were succeeded by Mr. and Mrs. Read. Hi Josh, We would be interested to hear some of your memories re the Old Meeting House. Do also look at the pages about Bradder Street.